A whopping 120% match bonus up to €500 & 200 free spins is now up for grabs at Alf Casino. Choose your favourite alien character and spin up a storm! Online Casino Reports (OCR) players are invited to join the legends of Alf Casino with a whopping welcome bonus. This exclusive offer for OCR players packs plenty of punch. 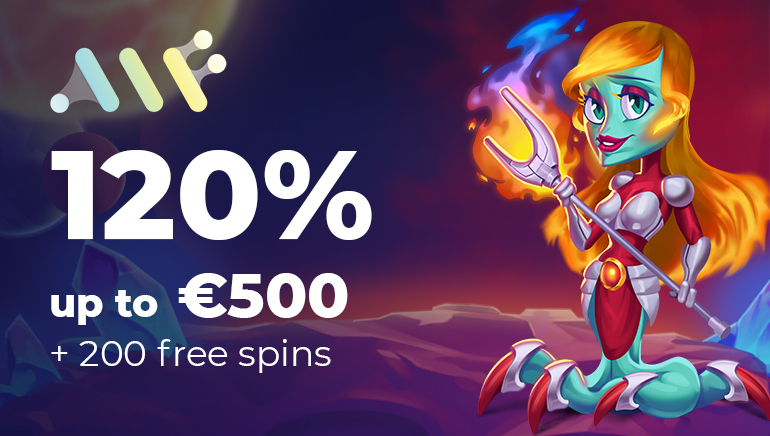 Players qualify for a whopping 120% match bonus up to €500 + 200 free spins. Alf Casino heroes are waiting to welcome you into the fold in the ultimate gaming challenge. Alf Casino is fully licensed and regulated by the Government of Curaçao to offer real money games to players. Getting started is just as much fun as claiming your bonus. You’ll be required to choose a hero – Flamma, Morbi, Terra, Tractus, or Liquidum. Each alien hero comes with a full bio. Players get to meet the heroes up close and personal, making the experience at Alf Casino that much more exciting. Games include a dizzying selection of slots, card games, live casino games, poker games, and others. Top titles like Mystic Mirror, Bollywood Story, Rio Fever, The Luckiest Year, Wild Scarabs, Hugo Goal, Chinese Zodiac, Judges Rule the Show!, and Pirates Charm are a few of the many wild games available. Once you claim your 120% up to €500 bonus, and the 200 free spins, Alf Casino’s incredible selection of games are yours to enjoy.